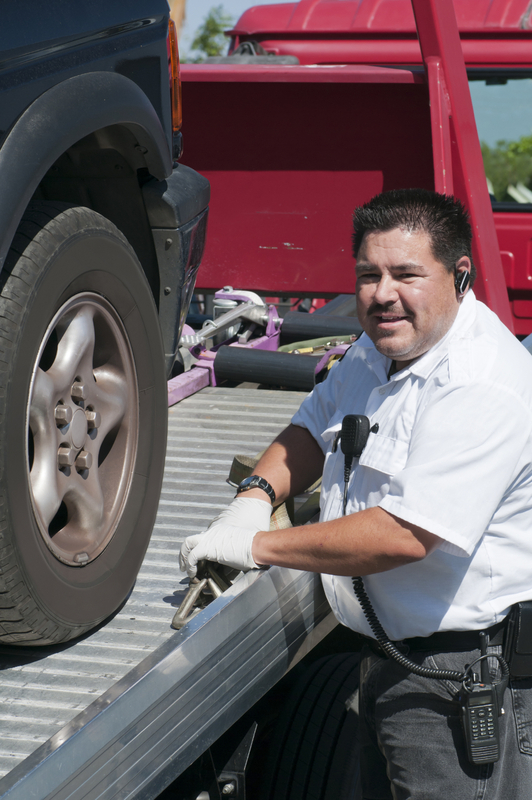 Repo wheel lifts are normally built onto a 1-ton pickup truck, like a Ford F-350 or a Chevy 3500. The truck is retrofitted to house the wheel lift, either in the bed, or under the body of the truck, beneath the bed (“underbody wheel lifts”). The wheel lift extends from the back of the truck, and lifts the car up by its two front or back wheels, depending on the vehicle. These typically pull small to medium sized cars and pickup trucks. Light Duty Wreckers (Class 1, Class 2, Class 3) – Light Duty Wreckers are smaller tow trucks with a GVWR of up to 14,000 pounds, and a boom with at least an 8,000 pound capacity. Light Duty Wreckers must have wheel lifts with at least 3,500 lift capacity, with safety chains, come-alongs, and dual rear wheels. They are capable of lifting an average sized pickup truck, passenger car or other smaller vehicles like motorcycles and small trailers. Examples of light duty trucks are the Toyota Tacoma or Dodge Dakota (class 1); Dodge Ram 2500 or Ford F-150 (class 2); and Dodge 3500 or Ford F-350 (class 3). Medium Duty Wreckers (Class 4, Class 5, Class 6) – Class B Wreckers are trucks with a GVWR of 14,000-26,000 pounds, a 12-ton boom, and two 10,000 pound winches. These trucks are for lifting and towing medium-sized pickup trucks, and box trucks, and large passenger vehicles, like limousines and buses. Examples of trucks rated for medium duty are the Dodge Ram 4500 or Ford F-450 (class 4); Dodge Ram 5500 or Ford F-550 (class 5); and Ford F-650 or International Durastar (class 6). Heavy Duty Wreckers (Class 7 & Class 8) – Class C Wreckers have a GVWR of at least 26,000 pounds, a minimum cab-to-axle length of 102 inches, a single or double boom, and single or double winch. These trucks are the Olympians of towing. They are for towing vehicles in excess of 17,000 pounds, such as semis and other industrial vehicles, heavy machinery, or large groups of smaller vehicles, and are capable of moving extreme weight. Examples of trucks rated for heavy duty are the GMC C7500 or Peterbilt 330 (class 7); and GMC C8500 or Kenworth W900 (class 8). Class 8 Heavy Duty trucks are the industrial cabs you see pulling dump trucks or 18-wheelers. Rollback / Flatbed – Rollback Carriers, or Flatbeds, are trucks that have a flat bed behind the cab, and the car rides on the bed. They do not have a boom. They use a winch to pull a vehicle up onto the bed to ride flat. These trucks typically also have an additional wheel lift, so they have the ability to transport a second vehicle behind the bed as well. 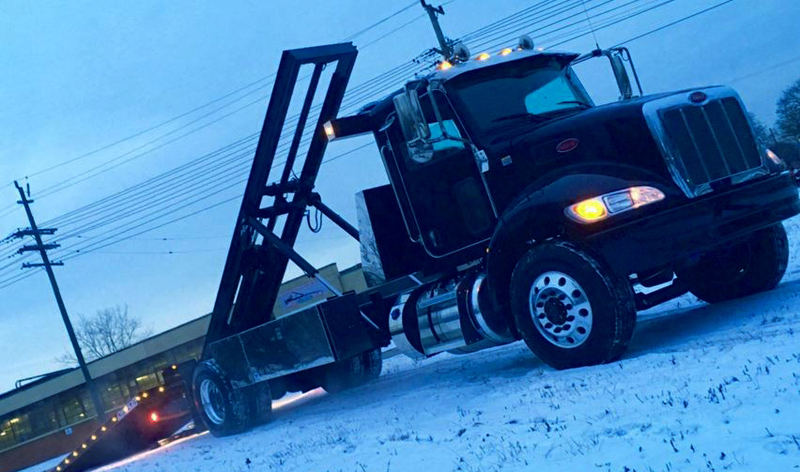 Detroit Wrecker Low Loader – Our Low Loader is extremely powerful, and we will only install it on heavy-duty trucks. The truck must have a GVWR (Gross Vehicle Weight Rating) or GVM (Gross Vehicle Mass) of at least 26,000 pounds. GVWR is a rating that the manufacturer specifies, which prescribes the total weight of the vehicle, trailer(s) and contents the truck can safely operate. Another important mandatory specification is the truck must have a cab-to-axle length of at least 126 inches. The four most popular trucks we recommend are the Ford F-750, the International 4300, the Freightliner M2, and the Hino 258 & 268.